We had to abandon last night's HyBIS launch, because the umbilical cable that connects HyBIS to the ship came out of its sheath. 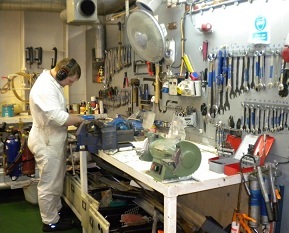 HyBIS was still connected to the winch and no-one was hurt, but for safety reasons we decided to replace a length of the cable. This took ten hours, not helped by the arrival of some stormy weather that made the ship roll and pitch more than usual. During all the fixing and mending, we ran 160 km of survey lines with the magnetometer to the north of Mount Dent. The magnetometer trails behind the ship just below the surface of the water, and the data it collects should tell us more about the rate at which the plates are rifting apart here at the Mid-Cayman Spreading Centre. Thank you for all the comments and questions about the animals living at the deep-sea vents. As mentioned yesterday, we can't say exactly what we have found until the biologists have checked out how life at these vents relates to life at other vents. 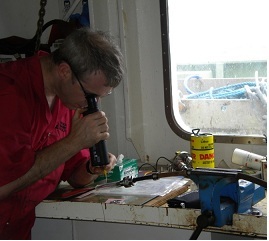 However, we can say a bit about life in the oceans and at deep-sea vents in general. There is usually more life in the oceans nearer the surface and in coastal regions, closer to sunlight. But although sunlight reaches to around 1000 metres deep in the oceans, it is only bright enough for photosynthetic organisms to grow down to depths of around 200 metres at most in clear open ocean waters (and much shallower than that in murky coastal waters). Although there is life at all depths in the oceans, it generally gets more scarce the deeper you go, because it is further from where new food is being made by photosynthesis. But at deep-sea vents, where microbes grow using chemical energy from the vents rather than sunlight, we find lush colonies of animals and microbes, in much greater numbers than at corresponding depths elsewhere in the deep sea. The food chains at deep-sea vents are relatively short. Microbes use chemicals in the vent fluids make organic matter, and these microbes can be closely associated with animals at vents. For example, at eastern Pacific vents, microbes living inside tubeworms use hydrogen sulphide from the vent fluids to grow and nourish the worms - and the tubeworms in turn are preyed upon by other animals. Paul Tyler, our expedition senior biologist and Chair of the International Census of Marine Life ChEss (Chemosynthetic Ecosystems) project, had this to say about the trip so far: 'Our expedition is progressing very well - our Principal Scientist Doug has structured the plans for work well, and overcome some of the problems that can occur with a multi-disciplinary team. We have found one vent site and are still looking for a second'. 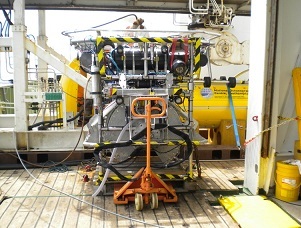 With Autosub6000 safely back on deck, HyBIS is having its pre-dive checks in preparation for a double dive, looking at the chemistry and geology of the deep-sea vents.